This document will provide basic wireless network connection procedure for the Microsoft Windows 8 operating system. Step 1: Open the Charms bar by pressing Windows + C on your keyboard. Alternatively, if you have a mouse, move the cursor to the upper right corner of the screen until the Charms bar appears along the right edge of the screen. If you have a touch-enabled device, swipe from the right edge of the screen to bring up the Charms bar. Step 2: Click Settings . 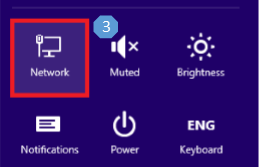 Step 3: Click on the Network icon. 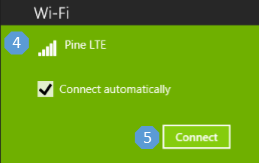 Step 4: Select the SSID “Pine LTE”. Step 5: Ensure that “Connect automatically” is check marked. Click Connect. Step 7: Click Next to establish connection.